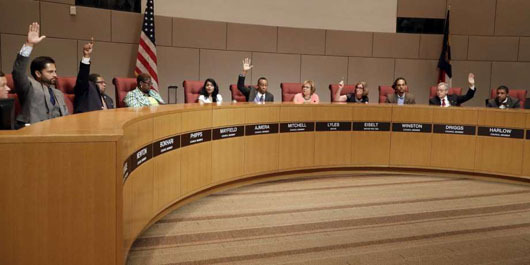 The Charlotte City Council on July 16 voted in favor of the North Carolina city hosting the 2020 Republican National Convention despite the presence of a “dangerous” President Donald Trump. The Democrat-controlled council voted 6-5 in favor of allowing City Manager Marcus Jones to negotiate contracts with the Republican National Committee (RNC) and the local host committee, the Raleigh News & Observer reported on July 16. City leaders expect to win the convention for Charlotte this week, the report said. The RNC site selection committee will make its decision at a vote in Austin, Texas. “Council members debated whether Charlotte could host President Donald Trump without endorsing him … but they ultimately decided that the potential benefits outweigh risks to the city,” the report said. Democrat Larken Egleston, who represents District 1, cast the deciding vote in favor of hosting the RNC. Lyles said she would not give a welcoming address at the convention even though its is common practice for a host city’s may to do so, even for an opposing party’s convention. RNC said the momentum for the host of the 2020 convention continued to be with Charlotte, though they cautioned that nothing is yet a done deal, the News & Observer report said. Las Vegas is currently said to be the only other location officially still in the running. Supporters of Charlotte hosting the RNC told the News & Observer that the convention would boost the city’s image, help the local economy and show the city is inclusive. Others indicated they may be OK with Charlotte hosting the RNC but not the likely renomination of Trump.